This is a very elegant and cute Chinese Juniper bonsai that was destined for our personal collection. With so many new trees coming through the doors we can't keep everything even though we'd like too :) The tree is ready for thinning, wiring and styling. Once the work has been completed this will be a top quality specimen worthy of a spot on any collectors bench. 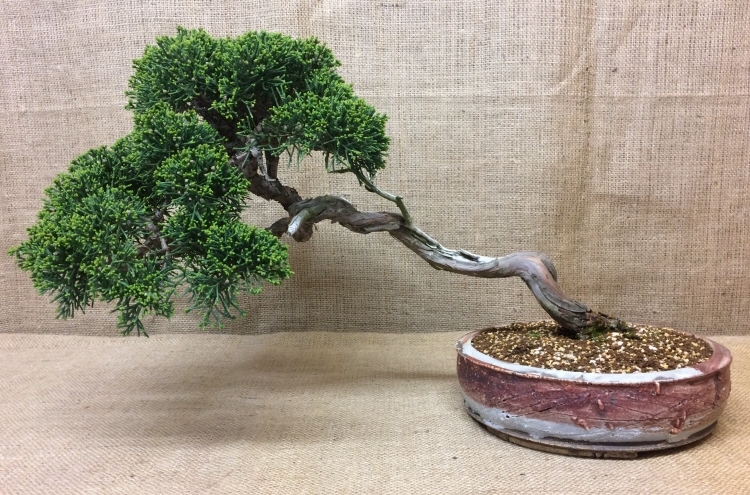 Junipers are very sort after and one of the most popular evergreen species used for bonsai. It grows very tight compact foliage in a relatively short amount of time. The tree has very nice shari that looks very natural and a very nice jin. Once the live vein has been cleaned revealing the bright red colour and the shari & jin have been treated with lime sulphur it will really bring the best out in this fantastic little Juniper. The tree is planted into a beautiful round Tony Remmington bonsai pot. A short walk around video showing the above tree. The video was taken in August 2017.